You'll be £10.00 closer to your next £10.00 credit when you purchase Castrum to Castle. What's this? The study traces the evolution of fortifications starting with those of the Romans and their successors. Included are the defences erected to resist Islamic invasions and Viking raids and the castles that were built during outbreaks of warfare. As the authors demonstrate, castles and other fortifications were essential factors in military calculations and campaigns – they were of direct strategic and tactical importance wherever there was an attempt to take or hold territory. The factors that influenced their location, layout and construction are analysed, as is the way in which they were adapted to meet the challenges of new tactics and weapons. The quality of this books research is such that it is likely to be of interest to scholars in a variety of fields, while equally, a 'layman' reader with an interest in Castles and 'Things Medieval' may well find it worthy of attention. War gamers and military modellers may also find its content of interest. 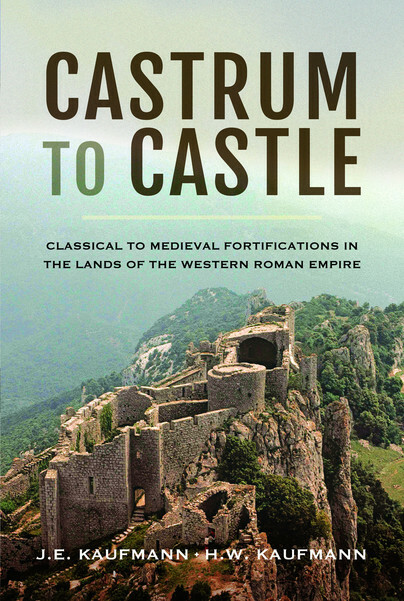 The authors have produced a solid piece of work, informative and attractively packaged, taking the inquiring reader on a fascinating voyage from the fortifications of the classical times to the great castles of the middles ages. Notes, a fully illustrated glossary and a bibliography (but no relevant websites are included) supplement the work. I look forward to part 2! The authors have done and excellent job in tracing the designs and skills and uses over the period. The work is supported by many images that have been reproduced in full colour through the body of the book. This must stand as one of the cardinal works on the subject. The quality of its research is such that it is likely to be of interest to scholars in a variety of fields, while equally, a ‘layman’ reader with an interest in ‘Castles’ and ‘Things Medieval’, may well find it worthy of attention. War gamers and military modellers may also find its content of interest.